Using solemn stillness stamp set and some shimmer paper. Love the new look! Card #6 Okay I saw something similar to this online and had to add some bling and snow to it. 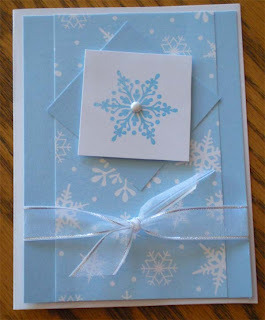 Card #7 A simple snowflake card. for those of us that like simple and love snowflakes! 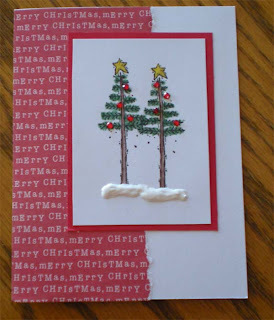 Snowflake from the new patterned pines hostess stamp set. Still working my head around the tree stamps in that set. They are cute but just patterned enough to take some extra thought on how to best use them. Card #8 These fun cards are cash holders (or checks, gift certificates, etc...) I made one for Liz for her birthday and She loves it. carries it in her purse as a money holder for her cash! 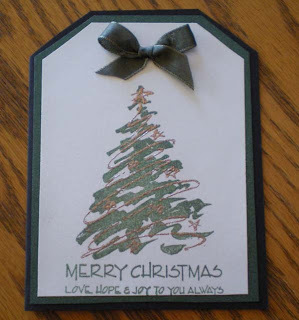 Hers was black and red with flowers but the same style of card. I have enough to make 12 of each card. These can be altered to have flowers, stamps etc on the scallop circle too. I have 2 more options in my mind but have yet to have time to get them on the paper. I wanted you guys to be able to see where we are at with the cards as soon as possible. Will update as I finish the next 2!